They're strangers who have one thing in common – family members who were killed in New Haven. And on Monday, they came together in an effort to make their community safer. 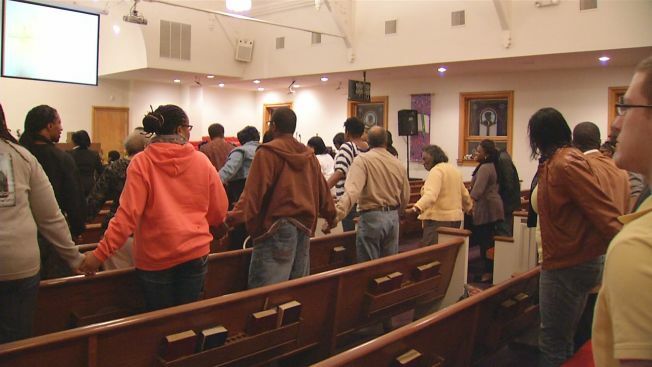 Families affected by gun violence stood together Monday night by attending a prayer vigil held at the Community Baptist Church in the Newhalville section of the city. A new non-profit, Mother's Demand Action, organized the vigil to show the young men and women touched by all the violence that somebody cares. "There's a lot of people out here who say they're gonna do something but sometimes they don't do stuff. They don't like to step up so I'm stepping up," said Kimberly Washington, founder of Mother's Demand Action. Church members and clergy from around the greater New Haven area agreed that there needs to be a new standard set in homes by parents, a standard Kim Mozell is trying to set for her three other children. Mozell lost her teenage son, Thomas, known as T.J., to a shooting last year, and police are still looking for the person responsible. "I'm still upset about the situation," said Kim Mozell, who is still grieving over the loss of her son in March 2012. "My son was murdered, gunned down in the streets of New Haven." Police found him shot dead in a parked SUV near County and Munson streets. T.J., a Hillhouse High School graduate, was just 19 years old. Police believe he was the intended target. "I feel that these kids need an outlet. Somewhere to go, something to do. We have to do better for our kids," Mozell said. "But we need as much community involvement, parents, churches, whomever to get involved so that we can start making a change." As police continue to look for T.J. Mozell's killer, the non-profit says it will have monthly prayer vigils and they're also organizing walks to try and curb some of the violence they've seen rip apart their community.